We were eye to eye. His fixed gaze made me forget the chill in the air. It was a clear, sunny day; the reflection of light bouncing off the snow was nearly blinding. I couldn’t take my eyes off him. He was absolutely magnificent. A living paradox. A creature of incredible strength, begging for help. And that was my first encounter with the polar bear. It was one of those moments when the world seemed to come to a halt. We were all alone – the bear and I. It felt like we were on the last remaining piece of ice. This huge, yellowish-white being was only a dozen feet away from me. He could easily crush me. The dream was vivid. I felt everything happening as if I were experiencing it consciously, awake. I’ve had other dreams that felt this way and they’ve all come true, so I didn’t take it lightly. They say how you feel after the dream is as important as how you feel during the dream. I didn’t feel afraid. I felt urgency. The polar bear was asking me what I was going to do to. His situation was dire and I felt a great responsibility to help him. Please send me registration information on the November 2008 trip. It turns out we may have one more spot available, so let me know if you are interested. And thus begins my second encounter with the polar bear. I leave for the Arctic on Friday and will be blogging, posting photos (and video when available) daily. More on this later, but I’m traveling with 2 scientists who have studied bears and Arctic ecology for more than 40 years. So if you have any questions you’d like me to ask them, please send them to me (click “Stay In Touch” tab above) and I’ll post replies here. 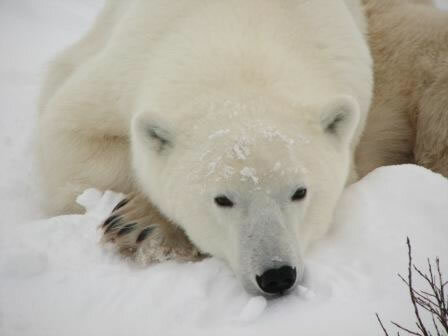 This entry was posted in Polar Bears and tagged Adventure, Arctic, Dreams, Ecology, Polar Bears, sustainability, Travel. Bookmark the permalink. I could feel the moment in your writing… I was touched, moved, and inspired..almost to the point of tears. I guess I’m just a sucker for animals and their well-being. I admire your conviction to travel such a long distance and experience this first hand. It is inspiring me… You are inspiring me… Thank you so much! I will watch your blog closely. We need to take action, I know that you will come back ready to move mountains with this… I got your back! I have a thing for Sharks & Tigers, go figure, ha!